Scaling the Cliffs of Insanity, Battling Rodents of Unusual Size, Facing torture in the Pit of Despair. True love has never been a snap. Once upon a time, a feisty old grandfather told his bedridden grandson a tongue-in-cheek fairy tale ... In the mythical kingdom of Florin, farm boy Westley rides off one day to make his fortune, leaving his true love, Buttercup, waiting patiently behind. Unfortunately, his ship is beset by pirates, and Buttercup grieves for many years, believing Westley dead. She reluctantly agrees to marry Prince Humperdinck, knowing that she will never love him. Humperdinck has his own plans for the marriage, however - he intends to have Buttercup kidnapped and murdered in order to set off a border war that will strengthen his power. But she is eventually rescued by a mysterious pirate, who turns out to be Westley in disguise. Their reunion does not last long, though, and the pair must face numerous obstacles before they can live happily ever after. $206.243 thousand on 9 screens. Since this “20th Anniversary Collector’s Edition” of The Princess Bride represents my fourth review of it, I’ll spare you the usual blather about the film itself. If you want my full thoughts, head back to my look at the 2006 special edition. To summarize, it's a charming and delightful little film that offers a fun and generally inoffensive experience. 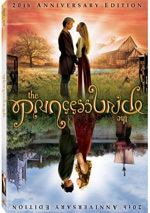 The Princess Bride appeared in an aspect ratio of approximately 1.85:1 on this single-sided, double-layered DVD; the image has been enhanced for 16X9 televisions. No substantial problems emerged during this strong transfer. Sharpness seemed very good. The movie consistently looked crisp and detailed, and I saw no signs of fuzziness. Moiré effects and jagged edges were not an issue, and I saw no indications of edge enhancement. It also lacked any form of source defects. Colors came across as wonderfully vivid and lush. The fairytale costumes looked bold and bright and often provided some of the movie's most lovely images. Black levels were evident mainly through costumes as well, and they also appeared deep and rich. Shadow detail was a minor consideration as not many dark scenes emerged, but the low-light shots seemed fine. All in all, the movie looked great. The 2007 edition duplicated the same Dolby Digital 5.1 soundtrack found on the three prior DVDs of The Princess Bride. That was fine with me, as I found the audio on the old disc to provide a surprisingly satisfying experience. The soundfield seemed strongly oriented toward the forward channels, while the surrounds appeared limited to some music and the occasional ambient effect. They worked especially nicely during the scenes that took place on ships, which offered some solid creaking sounds to accentuate the experience. Other than those exceptions, however, it was a forward affair, and a fairly good one at that. The front channels gave us a solid stereo image that seemed relatively lively. The soundfield wasn't exceptional, but it appears very acceptable for a film from 1987. What granted Bride its "B+" grade, however, was the strong quality of the audio. Dialogue seemed slightly weak at times, as I occasionally heard some mild edginess, but it generally appeared warm and natural. A few scenes sounded obviously dubbed, but most integrated the speech neatly into the mix. Intelligibility was occasionally an issue due to some accents, especially that of André the Giant. Effects were consistently crisp and clear, with no audible distortion, and few times we witnessed some nice bass as well, such as during the trek through the Fire Swamp; when the flames burst, they did so with splendid emphasis. Best of the mix was the terrific reproduction of Mark Knopfler's score. It sounded clean and smooth and also came with some excellent low end; the dynamic range of the music seemed much better than I'd expect from a moderately old film. Although the limited scope of the soundtrack let me rate it no higher than a "B+", the fine quality of the audio really worked well. Since this “20th Anniversary Collector’s Edition” of The Princess Bride represents its fourth DVD incarnation, some comparisons are in order. I thought all four offered virtually identical audio, but different transfers popped up along the way. This one seemed to reproduce the visuals from the 2006 special edition. That’s a good thing since it offered the best presentation of Bride to date. The 2006 special edition offered a slew of great extras – absolutely none of which reappear here. Instead, we get a game and a few new featurettes. True Love and High Adventure: The Official Princess Bride Game starts with a rhyming contest before it leads through an “eel punch-out”, and a boat-steering journey. To play more, you have to go to the game’s website, but why would you do so when this part is – dare I say it? – inconceivably lame? The mini-games are either really easy or poorly executed. The bad imitated voiceovers don’t help. The featurettes start with the nine-minute and seven-second Princess Bride: The Untold Tales. It mixes movie clips, archival materials and interviews. We hear from actors Robin Wright Penn, Mandy Patinkin, Fred Savage, Chris Sarandon, and Christopher Guest. They discuss sets and interactions on location, memories of Andre the Giant, favorite quotes from the flick, and some general thoughts on the film’s success. A few good insights appear here, and Guest gives us some funny moments, but don’t expect a lot of depth. This is a decent little clip without a ton of substance. Next comes The Art of Fencing. This seven-minute and eight-second clip features Patinkin, Guest, and sword master Robert Goodwin. The show looks at the sword-fight choreography, the choice of blades, and some additional notes on that side of the flick. It’s a reasonably informative little piece. Finally, Fairytales and Folklore goes for nine minutes and 16 seconds. It includes remarks from Sarandon, Savage, Penn, Patinkin and author Jack Zipes. The program looks at the appeal of fairytales, aspects of particular stories, and how Bride fits into this fabric. Zipes dominates and helps make this a pretty intriguing look at the genre. The set also includes a 16-page Booklet. This offers two mildly different tellings of the movie’s story: one from the Buttercup side and one from the Westley perspective. As with the clever DVD cover – which looks different if you flip it – you find each rendition on opposite ends of the booklet. This is a cute touch but not anything particularly special. During my four viewings of The Princess Bride, I maintained the same reaction. It was a very fun and charming little movie that may not merit its stellar reputation, but it remained consistently delightful nonetheless. This 2007 DVD replicated the excellent visuals and solid audio of the 2006 release but it dropped all of that edition’s extras and substituted only a few minor components. And that’s a shame. The 2006 SE formed a nearly definitive release of Bride, so I’m not sure what purpose this “20th Anniversary Collector’s Edition” serves. Fans won’t find improved picture or sound, so those who already own the 2006 disc won’t need this one. It’s also not something that should appeal to new fans, as they’d be best served by the excellent 2006 release. Unfortunately, that one now appears to be out of print, so they might be stuck with this inferior 2007 edition. My advice? Hit ebay or other resellers and find the 2006 special edition. Unless you can get it for a song and/or don’t care about extras, skip this lackluster “20th Anniversary” package.